Although a lecture-movie showing for ‘Authority & Resistance’ group, ALL Gateway students + profs are welcome to attend! 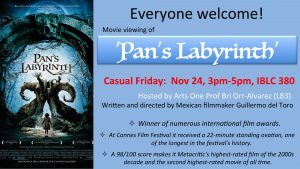 This week’s Casual Friday event will be the movie ‘Pan’s Labyrinth’! Hosted by Prof Bri Orr-Alvarez (LB3). Casual Fridays. 3pm-5pm in the Gateway Suite.